There's a Commissioner's Trophy on the mantle in Boston and that's all that matters. The organization's aggression on the trade market combined with lower Draft picks have kept the Sox from developing a deep and talented core in the Minor League ranks. Of those who are left, there are many questions. Michael Chavis (No. 79) is the lone representative in the Top 100, but is coming off a season in which he missed 80 games due to a performance-enhancing drug suspension. He also doesn't have an established position, though his combination of hit and power tools could force his way into the lineup anyway. Bobby Dalbec possesses tremendous power but an astounding strikeout rate. Jay Groome has dealt with multiple injuries, most recently Tommy John surgery that knocked him for all of 2018. Triston Casas and Antoni Flores have promise but are untested. Outside a healthy Groome, there isn't a nailed-on starter in the group with Darwinzon Hernandez, Tanner Houck and Bryan Mata looking like bullpen pieces. Boston has the resources to be fine for a long time, but if need be, it'll be difficult to fill many potential holes with internal solutions. It's Miguel Amaya and Nico Hoerner and then ... well. The Cubs run into a few of the same problems as the Red Sox with a system that was wrecked by trades -- just think of the ranking if Eloy Jimenez and Dylan Cease were still here -- and low Draft spots. Brailyn Marquez and Adbert Alzolay are interesting arms to follow, but the former has pitched just two games above short-season circuits and the latter only made eight starts in 2018 due to a lat injury. Amaya, who turns 20 on March 9, could be an impressive all-around catcher in time, and Hoerner has the hit tool to move quickly and help the big club soon after going 24th overall last year. But the best young talent in the Cubs organization already calls Wrigleyville home. Joey Bart does a lot to lift the Giants out of the bottom two. Last year's No. 2 overall pick is the game's top catching prospect after carrying his impressive bat and defensive skills quickly to the Minors. He could be a quick climber, and the Giants would love for him to become a good problem behind the plate with Buster Posey in short order. There is also hope that No. 92 overall prospect Heliot Ramos can turn things around after a difficult first season, and 17-year-old shortstop Marco Luciano has a high ceiling as a $2.6 million signing, though he's yet to be tested in the pros. The pitching is still thin, as attested to by the ranking. Outside Shaun Anderson, there are no clear Major League starters. It's going to take other methods to help San Francisco build a winner in the short term. Some similarities to the Giants here, except Milwaukee's group is a little more proven. Keston Hiura has a great shot at being the Brewers starting second baseman rather quickly, thanks to one of the Minors' best hit tools. But behind him are a lot of questions. Corey Ray has power and speed to burn, but may strike out too much to fulfill his potential. Brice Turang and Tristen Lutz lack truly standout tools, outside maybe Turang's speed. Only two of the Brewers' arms (Zack Brown, Aaron Ashby) rank among the top 10 prospects in the system. Milwaukee has plenty to be happy about in the Majors, and Hiura's arrival will be another. Once he graduates, it could be tough sledding unless others soar in his stead. Victor Victor Mesa may have felt like the beginning, but really, Sixto Sanchez was the foundation piece Miami needed to claim to get the farm system rebuild underway. It's still just a start. The right-hander is a bona fide major prospect, but it's a long drop from him at No. 27 to Mesa, who could be a toolsy outfielder but faces questions about his bat, at No. 99. Monte Harrison, Sandy Alcantara and Isan Diaz have appeared in the Top 100 in the past, but all have dropped out as they moved up the chain. First-round pitchers Trevor Rogers and Braxton Garrett have battled injury woes early in their careers. Like Mesa, 13th overall pick Connor Scott has above-average grades on his speed and defensive sides, but the offense will need work entering his first full season. With J.T. Realmuto gone, the Fish don't have the Major League assets to turn into multiple prospects any more. It'll take some impressive growthwith this group to get Miami higher in the months to come. Luckily, Miami's point of emphasis in 2019 should be on the development side. This is when pitching begins to become a strength. Four of the Yanks' top five prospects (Jonathan Loaisiga, Albert Abreu, Deivi Garcia, Clarke Schmidt) ply their wares on the mound, and other arms such as Roansy Contreras, Trevor Stephan and Michael King might have stood out in other systems. As for position players, Estevan Florial remains the top prospect in the pinstriped pipeline, but his stock has dropped as he continues to struggle making consistent contact. The next hopes in that department come from Anthony Seigler, Everson Pereira and Antonio Cabello -- three teenagers who have yet to play for a full-season club. New York fans might have grown accustomed to a bountiful farm, and that could still come with this group, given how young it is. It's a few years away, however, and that level of risk pushes the system down a bit. The D-backs boast three Top-100 prospects in Jazz Chisholm, Jon Duplantier and Taylor Widener, and all three have significantly good chances at helping the big club. In the case of Duplantier and Widener, that opportunity could come as early as this season with Arizona falling behind Los Angeles, Colorado and perhaps even San Diego in the National League West race. Outside that trio, Daulton Varsho, Kristian Robinson, Geraldo Perdomo, Alek Thomas, Jake McCarthy and Blaze Alexander were stellar performers in 2018, and the club added breakout prospect Andy Young in the Paul Goldschmidt deal. It's definitely a system on the climb, and a spot in the top 20 is within reach with a few more positive steps in 2019, especially if one of the top talents jumps into the top 50 prospect ranks. As has been mentioned plenty in the past few months, the new Orioles front office has a lot of work to do if the plan is to build around this system. Luckily, some of that work was done by the old regime with last year's deadline moves. No. 64 overall prospect Yusniel Diaz was the big get, and he joined No. 71 Ryan Mountcastle and No. 90 DL Hall to give Baltimore three Top-100 prospects. Fellow pickups Dean Kremer, Jean Carlos Encarnacion, Dillon Tate, Luis Ortiz, Zach Pop, Cody Carroll and Brett Cumberland bring some depth to the O's top 30, and the club added Richie Martin and Drew Jackson in the Rule 5 Draft to help for a lack of depth in the Majors. Although it doesn't count at the moment, Baltimore owns the first overall pick in the 2019 Draft, and should boost the system accordingly. The foundation here is clear. Kansas City added a lot of quality pitching in last year's Draft, headlined by top pick Brady Singer and followed by Daniel Lynch, Jackson Kowar and Kris Bubic. Before that, the base was built around position players like Khalil Lee and Nicky Lopez and 2017 picks Nick Pratto and MJ Melendez. Outfielder Seuly Matias truly put himself on the map with 31 homers in 94 games at Class A Lexington. An impressive first full season by the arms and some additional improvement by the bats would be most welcome in an organization that is well-rounded but lacks high-ceiling prospects. Since the 2015 Draft, the Rockies have earned points for No. 10 overall prospect Brendan Rodgers. That could come to an end soon, from a Minor League standpoint, with Rodgers one stop away at Triple-A Albuquerque. 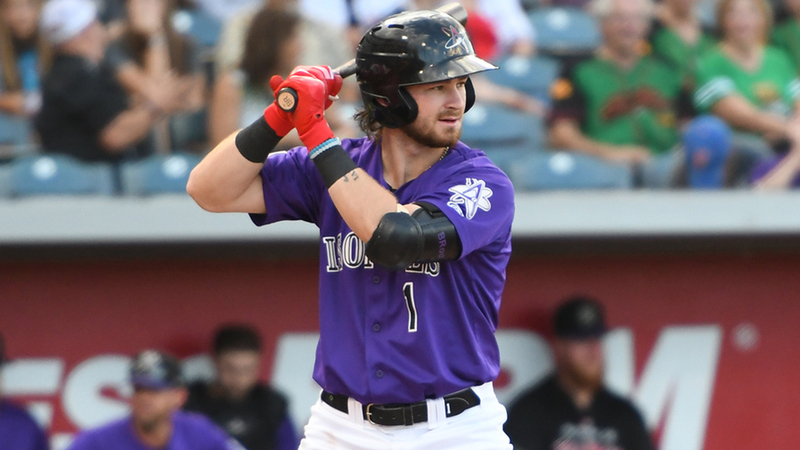 Infielder Garrett Hampson has hit and run his way to the Majors already and should be a big contender for the second-base spot this spring. Peter Lambert is right there as well after his first turn in the Pacific Coast League, even though he's dropped out of the Top 100 after some struggles there. Hard-hitting third baseman and No. 95 overall prospect Colton Welker will be tested away from an extreme hitters' environment for the first time. Outside those, the next big hopes are 2018 picks Grant Lavigne and Ryan Rolison. Luckily, the Colorado rotation is young because the arms are the system's weakness. But the Rockies have developed bats impressively, and that should continue apace in the months to come.